Networks of Informers 7 – Does Barack Obama have a ‘Multiple Civilian Casualty Policy’ in dealing with terrorism? 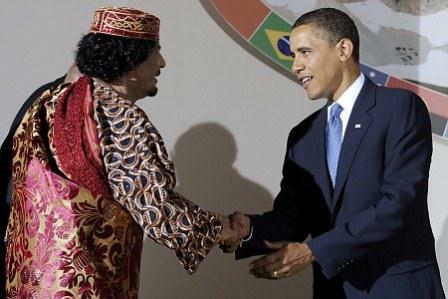 US President Barack Obama, right,and Libyan leader Moammar Gadhafi pictured during the G8/G5 summit in L'Aquila, Italy Thursday July 9, 2009. The double standards endemic in international reporting of conflict is apparent in the manner in which Sri Lankan officials are turned into witnesses against the Sri Lankan state whenever they say things that go against the standard view of Sri Lankan officials. We are co-opted as it were into temporary membership of the network of informers the nastier elements in the international community have set up, if we declare that there were civilian casualties during the conflict. This is never treated as a statement, but is rather almost always described as an admission. This makes no sense except in terms of a discourse redolent with preconceived prejudices. In itself the existence of civilian casualties in modern warfare is not something surprising, but what occurs in Sri Lanka has necessarily to be accompanied by finger pointing. When it happens In other theatres of war, it is considered quite acceptable. When American drones strike civilians in Pakistan, when NATO bombs hit civilians in Libya, this is something quite natural, to be accompanied by perfunctory regrets, more often than not involving suggestions that the fault lies entirely with the enemy. There is no suggestion whatsoever that such actions, the taking of targets even though there might be risk to civilians, is an intrinsic part of Western policy. Personally I do not believe that Barack Obama would actually subscribe to a policy of multiple civilians casualties. 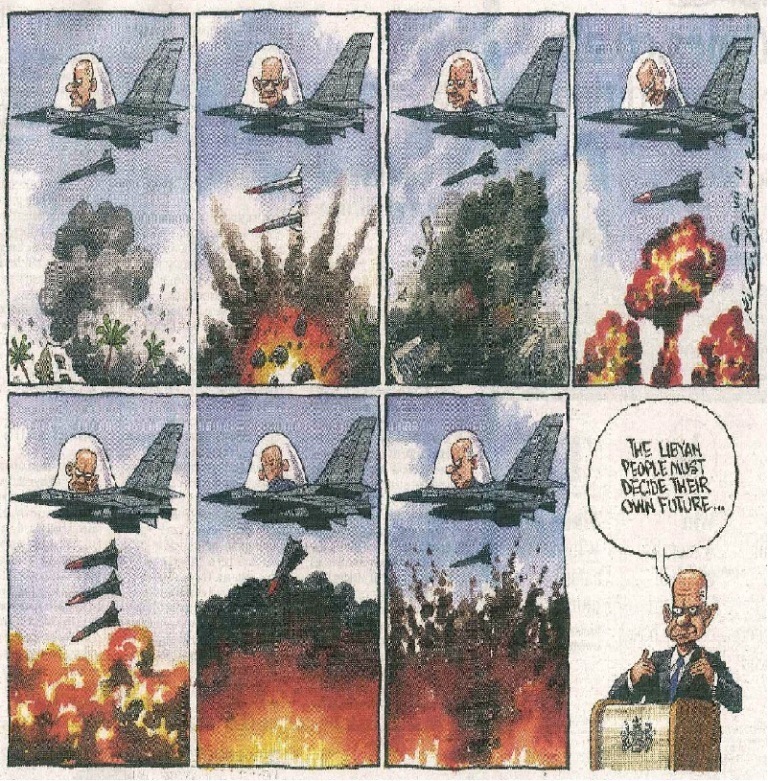 I would like to think that – unlike perhaps some of his predecessors, who saw themselves as the scourge of God in dealing either with infidels or communists – he would even suggest that maximum care should be taken to avoid civilian casualties and that targets should always be military ones on pretty good if not always foolproof evidence. But the continuing saga of civilian deaths in all theatres of conflict in which the West is involved – in which the West indeed began conflicts for a range of reasons that often went against United Nations policy – suggests that there has been no policy of avoiding civilian casualties at all costs. On the contrary, I would like to think that Barack Obama, unlike obviously some of his commanders on the ground who think that not just enemies but also potential enemies – and those who might conceivably be offering support to enemies – are fair game, would want a policy of never attacking civilians on their own; but it is clear that he feels no great anguish (a little I hope he does feel) about civilians, children, patients, killed in the course of what he must I hope insist are primarily military operations against defined military targets – such as the weaponry placed near a Libyan hospital that figured in one NATO justification of /apology for – civilian deaths. With regard to that last, no Western commentator would claim that the incident represented a reversal of any policy of ‘zero civilian casualties’. Indeed no Western commentator would dream of asking a Western power what its policy was with regard to civilian casualties. On the contrary, it is simply understood that one must avoid civilian casualties as possible, one should not deliberately target civilians, one should ensure even when targeting military objects that any possible harm to civilians is proportional – but that civilian casualties will occur is not considered an intrinsic moral problem. We are not dealing with Dostoyevsky’s Alyosha, but equally clearly that does not make Barack Obama the Grand Inquisitor. As far as Sri Lanka is concerned however, it is open season on anyone and everyone, whatever they say. The manner in which some elements in the international media seek to manipulate opinion is exemplified by reactions to the Defence Ministry report on the conflict, with stress on acknowledgement that there had been civilian casualties. This is both false and illogical. I had been cited two years ago in the Guardian in London as having ventured an estimate of civilian casualties, in an article which had a headline dwelling on the higher figure suggested – Sri Lanka says up to 5,000 civilians died in Tigers battle’. And in case the Guardian – in the form of an intelligent regular correspondent unlike Gethin Chamberlain of 11 throat cut imaginary women fame – is not considered evidence, this statement is cited both in the Darusman Panel report and in Gordon Weiss’ book. Symptomatic perhaps of the schizophrenic Weiss approach to truth is the fact that I have the distinction of occurring twice in the book, under two different spellings. Under the wrong spelling I am merely secretary to the Minister of Human Rights, not indeed to the Ministry, which is an understandable error since Weiss obviously has no interest in understanding the independent role of administrators. Poor Mahinda Samarasinghe is one of Weiss’ bugbears, described as ‘a single good advertisement for the straw man of Sri Lanka’s rule of law’, along with me (with Palitha Kohona joining us in another place as sustaining ‘the elegant conceit that a system of meaningful accountability exists in Sri Lanka’). However, as though to acknowledge the efforts I have made in this and other fields, Weiss creates another identity for me elsewhere, spelling my name correctly and describing me as ‘one of the most vocal Sri Lankan civil servants, and now a member of parliament’. He describes the interview in the Guardian as ‘the first such admission by the government that the battle had exacted a terrible toll on civilians’. This suggests he had completely ignored everything I had written earlier about the way the civilians were suffering and being killed. However it is understandable that Weiss should have ignored this, because as UN spokesman he must bear much of the responsibility for the UN having failed from 2007 on to have highlighted the LTTE forced recruitement of civilians and children, and its holding back of civilians (including UN employees and their families). Sadly, given the exaggerated respect our officials have for minor UN staff – as opposed to the UN system in general, which should be respected, given the high quality of most senior administrators we deal with – we have not written to the UN asking for an inquiry into the continuing suppression of information in this regard. So, whereas we kept pointing out how civilians were being abused, the strategy the LTTE initiated is now fulfilled by characters such as Weiss and the media, which perpetuates falsehoods as well as inconsistencies. Obviously the existence of civilian casualties is not a reversal of a zero civilian casualty policy, otherwise it must be assumed that no armed force has a zero civilian casualty policy. The fact that civilian casualties occurred, contrary to its accusatory characterization as an admission, is nothing to be surprised about, unless we had kept insisting that there had been no civilian casualties at all. I have answered, most recently to News X in India, in an interview I hope will be shown in Sri Lanka too, that such a use of language is either foolish or wicked, certainly very confusing. The recent characterization of the Defence Ministry report exemplifies my point. But the failure to apply the same standards to that sweet crusader for Human Rights, Barack Obama, is evidence that the commanding heights of moral indignation will continue to be used selectively.